Snapshots taken in the Zen Parade app. 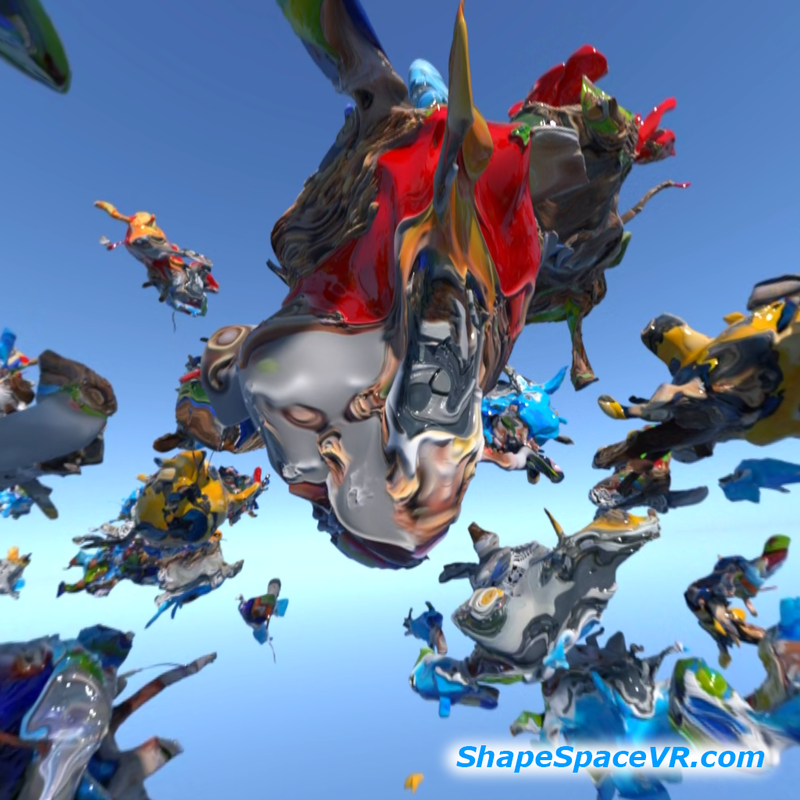 Zen Parade is the first Shape Space VR app release. 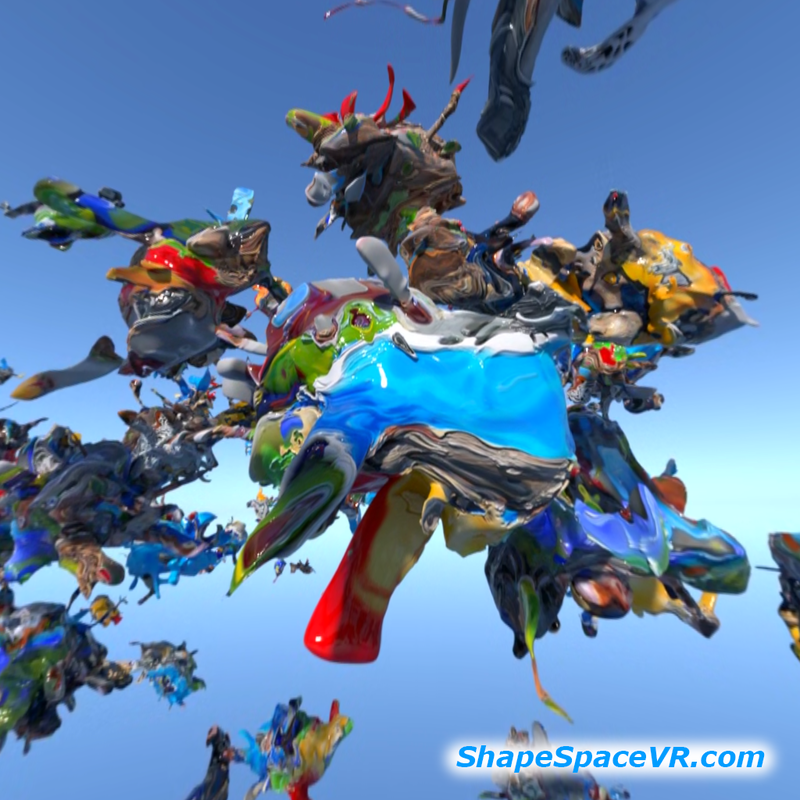 The app can be downloaded for free for the Gear VR on the Oculus store and provides a one minute preview of Zen Parade and a gallery with four, 3D 360º VR still art works; "Blortimer", "Blue Oyster Blort", "The Blort Field" and "Sculpture Sky Island". A one time in-app purchase of $4.99 (Now on sale for $2.99!) enables the full five minute immersive audio-visual art experience that can be enjoyed anytime to relax and rejuvenate. There is a looping option and you can pause and take snapshots from within the Zen Parade experience for sharing. Zen Parade is not a game. It is a virtual reality art experience that explores virtual reality as an artistic medium in and of itself. 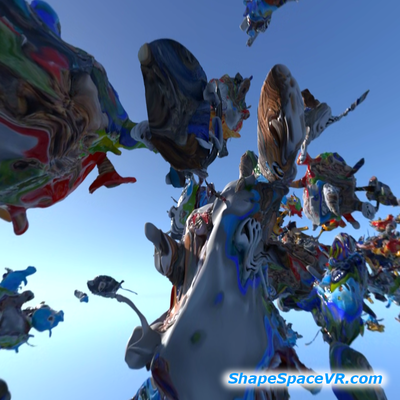 Shape Space VR is inspired by nature, technology, and transcendent visions. Zen Parade uses spatial presence and a variety of perceptual mechanisms to engage the imagination, inspire wonder, and enhance well being. The juxtaposition of abstraction with realism triggers pareidolia. This makes the experience unique for each person, each time they experience it, even though the content is the same. Zen Parade is a refuge from the verbal mind, an entertaining place where you can escape and be rejuvenated. 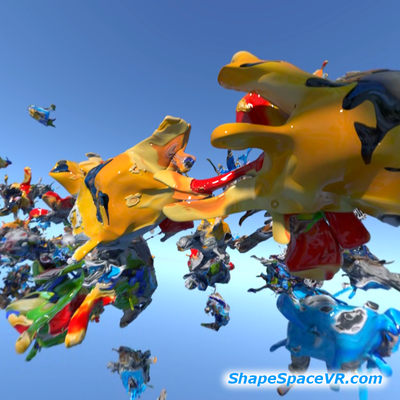 Shape Space VR is a family affair. Mack's wife, Snow Mack, serves as executive producer. Their son, Ray Mack, composed the score, which employs a variety of sound healing techniques. Their son, Jonathan Mack, a top visual effects animator, provides technical support and created the 360 degree stereo lens shader that makes Zen Parade so dimensional. Shape Space VR is dedicated to depicting and inspiring the transcendent visionary experience. Kevin's work is inspired by transcendent visions, technology, and natural phenomena, and is informed by research in a wide range of fields from neuroscience to artificial life. Among the first to exploit the unique capabilities of 3D printing, Mack produces sculptural forms that cannot be achieved by any other means. Kevin created ShapeSpaceVR to realize his lifelong dream of sharing his artistic visions as immersive virtual reality art experiences. 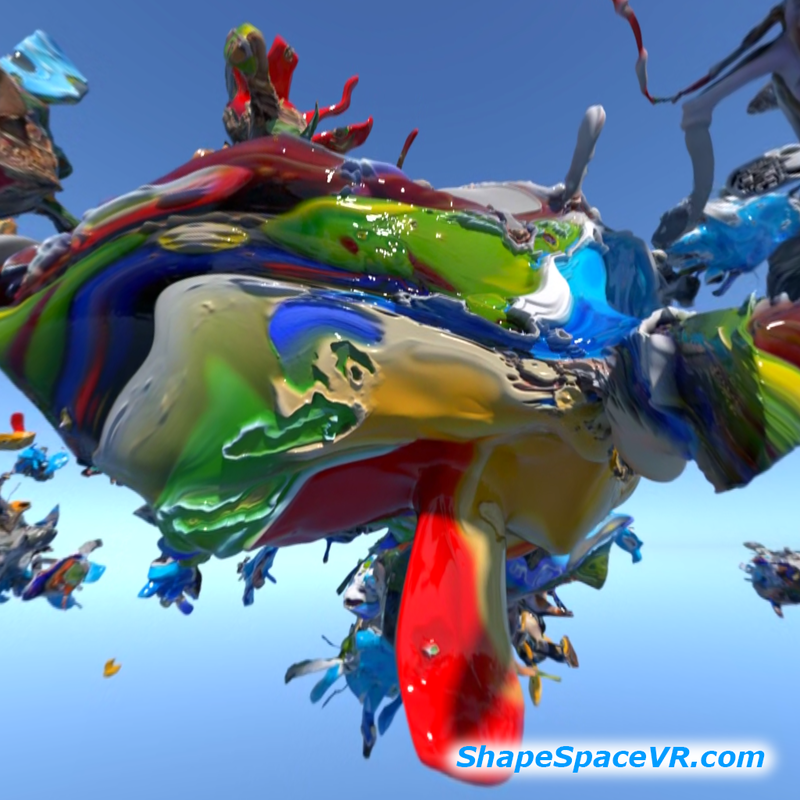 Kevin brings decades of exceptional creative and technological innovation on his mission to create new dimensions of imagination and wonder for virtual reality. Composer, DJ, producer, sound designer, and audio engineer are just a few of the hats worn by musician, Ray Mack. Ray started playing multiple instruments and improvising songs when he was a toddler. Classically trained in piano and violin, Ray performed in the nationally acclaimed Santa Monica High School symphony orchestra, which was chosen to play Carnegie Hall in 2001. Ray continued his musical education at Musician's institute and studied Mandarin on his own. Ray has traveled as a touring DJ in Asia and Indonesia. Combining his knowledge of meditation and music with inspiration from his travels in the mountains of Tibet, where he recorded chanting Monks and traditional Tibetan musicians, Ray has created a soundtrack that compliments and amplifies the mood altering effects of the Shape Space VR visuals. Jonathan grew up surrounded by technology and began working with procedural 3D animation software when he was only eleven years old. Soon he was building state of the art computers for his family and friends. Jonathan studied Engineering Physics at Berkley and photography at Santa Monica College. His discerning eye, encyclopedic knowledge and formidable technical skills made him a natural fit for computer graphics. Jonathan has worked in gaming, and film and commercial visual effects at Activision, Digital Domain, Sony Imageworks and most recently as FX Lead at Method Studios. 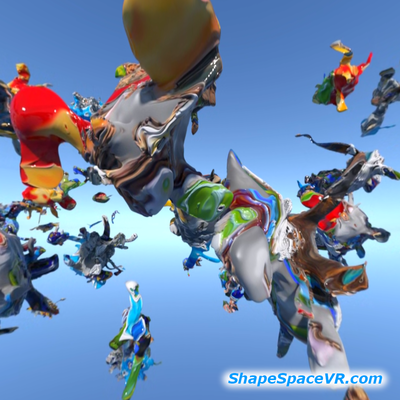 Jonathan's technical expertise and creative insight has been instrumental in the evolution of Shape Space VR. He also created the 360 degree stereoscopic lens shader that makes Shape Space VR so dimensional. Snow Mack is an accomplished fine artist and pioneering digital matte painter. Her work has been a fixture in the Pop Surrealism movement and has been included in museum and gallery retrospectives as well as books and catalogs documenting the history of the movement. Snow and Kevin have been collaborating creatively since they met at Art Center College of Design in 1980. ​Shape Space VR benefits from their decades of experience working together to create excellence for the visual effects industry.